You know what to expect from a Reese's Peanut Butter Cup. Namely, you expect peanut butter surrounded by chocolate covered in an orange wrapper. One man, however, was dealt a shock when he bit into one of the candies to find nothing but chocolate staring back at him. Sure that he found a statistical anomaly, Reddit user alexbchillin presented the issue to the internet, and it quickly became viral. Responding to the man's worst candy nightmare, Reese's sent the guy an ungodly amount of candy to make up for the peanut butter void. The Redditor, whose real name is Iowan Alex Hentges, told Insider that the incident started like any other normal day at work. He said that his peanut butter cups seemed a little strange at first, like something might have been missing from the candy's core. "They were room temperature, and I knew something was off because it wasn't squishy," he said. "So I decided to break it in half after opening and found the disaster." Hentges says he found six faulty peanut butter cups that were conspicuously lacking any peanut butter. With the initial Reddit post gaining traction, Hentges contacted Reese's about his peanut butter problem, in what he says was initially a joke. "I've had people message me already asking for them, but I'm not looking for money for this. I legit just thought this was funny when I got it and posted to Reese's FB page more as a joke than anything. This whole thing BLEW UP." 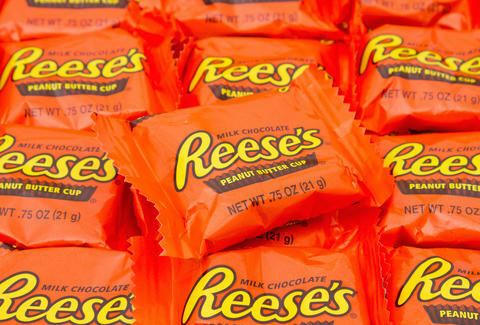 But given the potential for a PR nightmare — Redditors were calling the peanut butter cup a "crime against humanity," after all — Reese's sent Hentges some coupons. This was just the beginning of Reese's mea culpa though, as the company sent him a huge care package full of candy to atone for its snafu a few days later. In a handwritten note, Reese's said it was delivering "enough chocolate AND peanut butter to make everything cool between us." Some people on Reddit have said that this was probably a coordinated marketing stunt between Hentges and Reese's, but the man has denied all allegations of collusion with the candy company. Suffice it to say that complaining on the internet about chocolate can produce results.